You know all those share buttons across the Web? They are getting more and more social. What I mean by that is initially they were used to share stories or content mostly via email on a one-to-one basis, but over the past year or so services like Facebook and Twitter have been overtaking the way people use those buttons to share stories, videos, images, and links. The way most people interact with these button is through widgets on publisher’s sites. But one of the largest sharing button networks, ShareThis, is about to turn that around and introduce a Share Stream which shows you what your Facebook friends are sharing across the Web. Soon your Twitter followers will be added as well (at launch you will only be able to see what everyone is sharing across Twitter) . Of course, the Share Stream is also available as a customizable widget to show on any site. A link at the bottom of each ShareThis widget will invite you to find out what your friends are sharing. When you click on it, you will be taken to a Share Stream where you can log in using your Facebook, Twitter, Google, or Yahoo IDs. There you will see what your else people are sharing from the site you just came from or about the same topic as the page you were on. 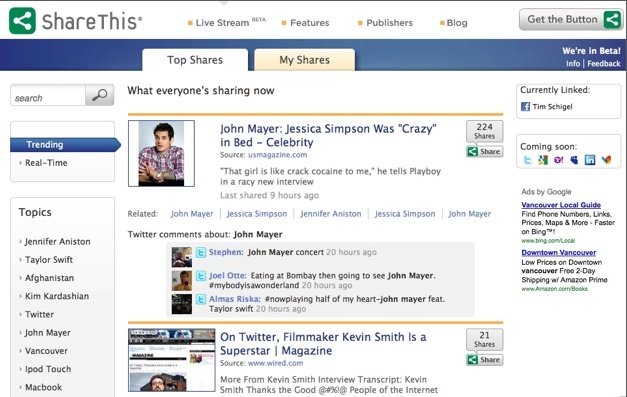 The Share Stream can be filtered by trending or real-time topics, by source, by what everyone is sharing, or only by what your friends are sharing. ShareThis gets its data from the 130,000 sites which use its sharing buttons and collectively reach 430 million unique visitors a month. Its No.1 competitor AddThis is somewhat bigger, but ShareThis recognizes the same users across sites and creates a semantic index of the every page where its buttons are placed. Using a taxonomy based on Wikipedia categories, ShareThis can figure out the topics associated with each page that is shared. Thanks to this topic knowledge, ShareThis can suggest other pages on related topics which are also being shared by your friends or more generally. CEO Tim Schigel plans to create an ad network of sorts which will let publishers and advertisers target ads to people based on what they are sharing based on browser cookie data (yup, every time you share, you are being tracked, anonymously). He keeps data on engagement levels after people share content, and while the pageviews resulting from each click are still highest for email, Facebook is catching up. And Facebook has a bigger multiplier effect (on average three different people click on each shared link versus just one for email) which puts it over the top in terms of impact. Twitter’s multiplier effect is six times higher (18 clicks per link), but its engagement levels are much lower. More importantly, people who follow a link from Facebook, says Schigel, “are 50 percent more engaged,” on average, than people who find the same page from search. Intuitively that makes sense because there is more hit or miss with search results compared to following a suggested link from someone you trust. Like other sharing networks, ShareThis has seen Facebook soar to 42 percent of all sharing, beating out email (at 40.7 percent) for the first time in February. Twitter represents 8.7 percent of all sharing via the ShareThis button. So the Share Stream pretty much already exists on Facebook and Twitter alone.